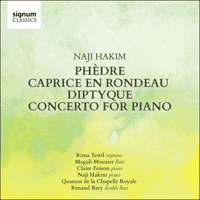 This new recording in Signum’s series with prolific composer and organist Naji Hakim includes a vibrant selection of his chamber works and features performances by Rima Tawil, Magali Mosnier, Claire Foison, the Quatuor de la Chapelle Royale (with Renaud Bary) and the composer himself. This cantata is a setting of two great movements from Jean Racine’s great tragic book of the same name. The first is Phèdre’s avowal of love to Hippolyte and her outburst of passion, from Act II, Scene 5, and the second is from Act V, Scene 7, where Phèdre makes her confession to Thesus. The form makes reference to the 18th century secular cantata. The poignant expressiveness of Racine’s text is brought out by the use of continuous recitative, modal and chromatic harmony and figurative images in the trreatment of both vocal part and piano accompaniment. The world premiere was performed by Dominique Hellsten, soprano and David Roblou, piano in the Purcell Room, London on 14th October 1998. To Debra Johnson This sprightly piece contains a number of themes—including two by Jean-Philippe Rameau—and combines the characteristics of rondo-sonata, variation and arch forms; when recapitulated, the themes are often varied and in the reverse order of their first appearance. The world premiere was performed by Debra Johnson, flute and Naji Hakim, piano, in Dallas, Texas, USA on 26th June 1998. This diptych is for flute (or txistu or recorder) and piano (harpsichord or organ). The Cantilène is based on a melody of the 18th century, probably by Giovanni Battista Pergolesi (1710- 1736), popular in several countries with different texts: “Que ne suis-je la fougère”, “Bonne nuit les petits”, “Adieu, pauvre carnaval”, “San Pantzar” and “Wa habibi” among others. The Humoresque is a varied rondo using the characteristic tonalities of the txistu (a basque flute with three holes): it moves through F major, D minor, C major, A minor, B flat major, G minor, Eb major, C minor, Ab major and F minor. The World premiere was performed by Garikoitz Mendizabal, txistu, and Ana Belén García, organ, in Sanctuario de Torreciudad, Spain on 5th August 2016. This concerto follows the structure of the Italian overture—fast, slow, fast. The first movement is a sonata form without development, based on three themes, respectively rhythmical, oriental and waltz. The second movement is characterised by an initial theme with chopinesque-contours, followed by a more agitated theme and then a choral-theme accompanied by a carillon in the treble of the piano. The recapitulation includes a cadenza and variation on the choral-theme. The finale is a rondo with a happy refrain twirling as a tarentella. Its festive and dancing episodes are conjugated with the perpetuum mobile of the refrain and its variations, until the brilliant and luminous coda. The world premiere was performed by Claire Foison, Quatuor Quad (Jeanne-Marie Conquer, Thierry Maurin, Isabelle Lequien & Philippe Bary) and Renaud Bary, in Château du Domaine Saint François d’Assise, La Celle Saint Cloud, France on 8th February 2015.